Heres a 12x7 hybrid snare drum I just finished. Very interesting. How's it sound? It sounds pretty good actually. A lot of crack with some warmth to it. jnewlon_drum wrote: wow!! thats sick!! PJ supplies all of his drums with Attack heads, unless otherwise specified. 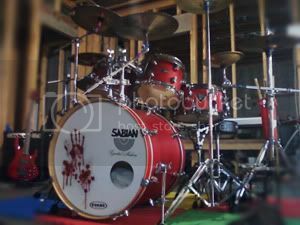 Yes Attack comes standard but I can provide Evans and Remo heads as well. Attack are hit and miss. The Terry Bozzio signature heads are pretty good. I put them on all drums I build, some people like them, some don't. Timekeep69 wrote: Attack are hit and miss. The Terry Bozzio signature heads are pretty good. I put them on all drums I build, some people like them, some don't.